Artist Jo Grishman has been practicing for her art her entire life, with collecting found objects wherever she may go. She incorporates objects that may have been lost, hold personal significance or possess some quality that attracts her to them. 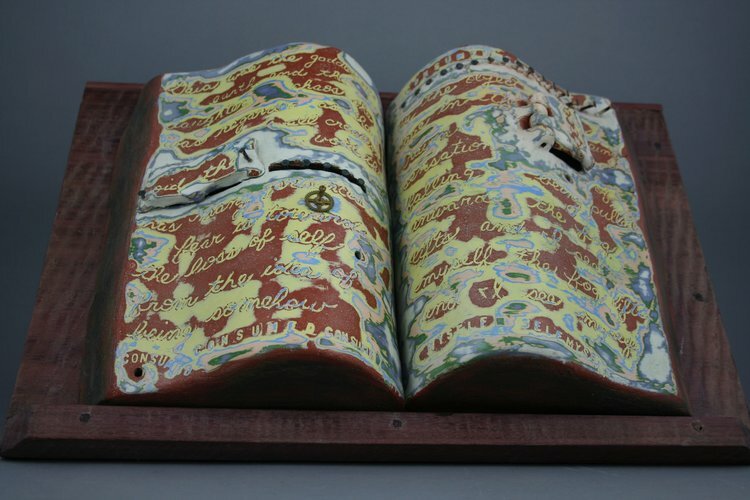 She fires her clay sculptures and will affix the objects throughout her work and has even mixed her recent encaustic skills in as well. She works toward self discovery and letting go with her artwork, and always has something new to teach all of us. "I am a collector, a collaborator with nature, often using found objects in my narrative clay sculpture. My greatest inspiration is motherhood and nature. Working with clay is a tactile, spiritual interaction. It's a dance as the image emerges and takes on a life form of it's own. The story gradually reveals itself and not always upon completion of the piece. It is a gradual unfolding."